Personalised Tote Bag with a name or initals mongrammed to make a truly special gift. 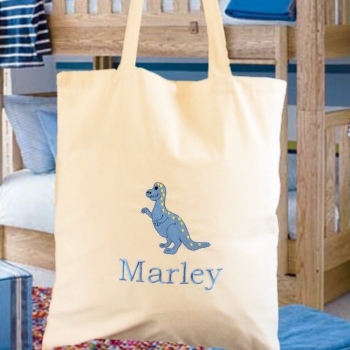 Personalised Tote Bag with a name or initals mongrammed to make a truly special gift. Unique and useful gift idea for men, women and kids - a gift suitable for any occasion or holiday! Choose the Text. Personalised Tote Bag with a name or initals mongrammed to make a truly special gift. Unique and useful gift idea for men, women and kids - a gift suitable for any occasion or holiday! Choose the Text. Choose the Thread Colour. We will produce your gift especially to order and ship your unique gift to you or your chosen recipient. We use quality 100% cotton natural unbleached and non dyed tote bags that are practical and decorative at the same time! Strong enough to carry shopping or for use as a book bag and lightweight enough to fold up. Portrait shaped and measures 38cm wide x 43cm long with long handles for carrying over the shoulder. You may choose to have an embroidery motif added for a small additional charge. We have many embroidery designs to choose from. Please click the big green link under the picture to view these and make your selection. At Amys Gifts we do all our own embroidery work especially made to order. Any queries or special requests please email us. Check out the matching tea towel, adult apron and childs aprons we can make to go with this personalised tote bag!